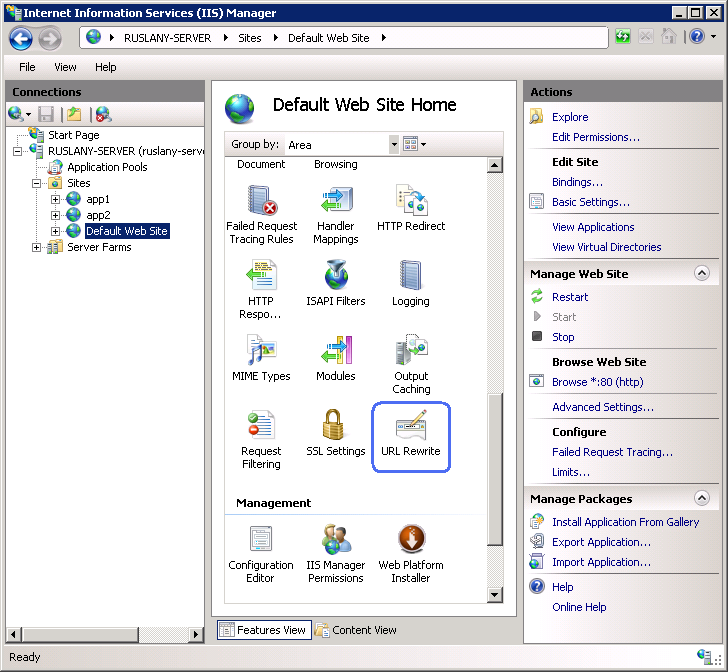 This section of the documentation applies to the URL Rewrite Module Version 2.0 for IIS 7. 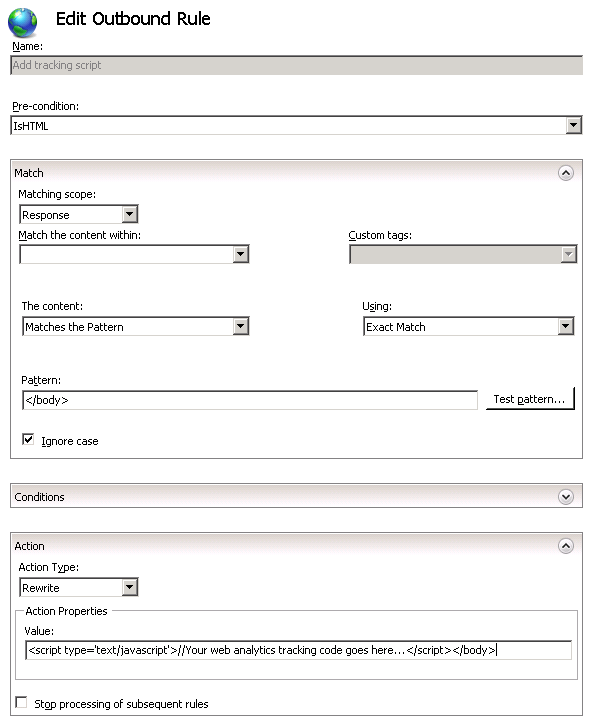 This walkthrough will guide you through how to create an IIS outbound rewrite rule that inserts Web analytics tracking script into Web pages. URL Rewrite Module 2.0 RCrelease installed. In some cases, the addition of tracking code to the Web pages is a simple task. However, in many cases it might be necessary to manually add the script to numerous Web pages. In those cases, the Web analytics instrumentation becomes an expensive and time-consuming task. The response rewriting capability in URL rewrite module version 2 can help in those situations by executing the outbound rules that change the response content on the fly. In the Feature View select "URL Rewrite Module"
In the Actions pane on the right hand side click on "Add Rules...". In the "Add Rules" dialog select the "Blank Rule" under the "Outbound rules" category and click OK.
An optional precondition that controls whether this rule should be applied to a response. The pattern to use for matching the string in the response. An optional set of conditions. The action to perform if a pattern is matched and all condition checks succeeded. In the "Name" text box enter a name that will uniquely identify the rule, for example: "Add tracking script". A precondition is used to evaluate whether the outbound rules evaluation should be performed on a response. For example if a rule that modifies HTML content, only HTTP responses with content-type header set to "text/html" should be evaluated against this rule. Outbound rules evaluation and content rewriting is a CPU intensive operation that may negatively affect the performance of a web application. Therefore, use preconditions to narrow down the cases when outbound rules are applied. Because the rule that you are creating should be applied only on HTML responses, you will define a precondition that checks whether the HTTP response header content-type is equial to "text/html". In the Pre-conditions list, select "<Create New Pre-condition...>". 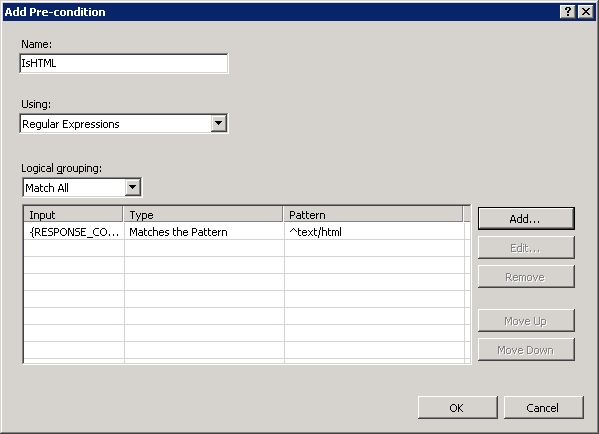 Check if input string: "Matches the pattern"
Click OK to save the precondition and to return to the "Edit Rule" page. The outbound rewrite rule can operate on the content of an HTTP header or on the response body content. This rule needs to modify the response content so in the "Matching Scope" drop-down list choose "Response". In the "Using:" drop down list, choose "Exact match" option. Save the rule by clicking on "Apply" action on the right hand side. 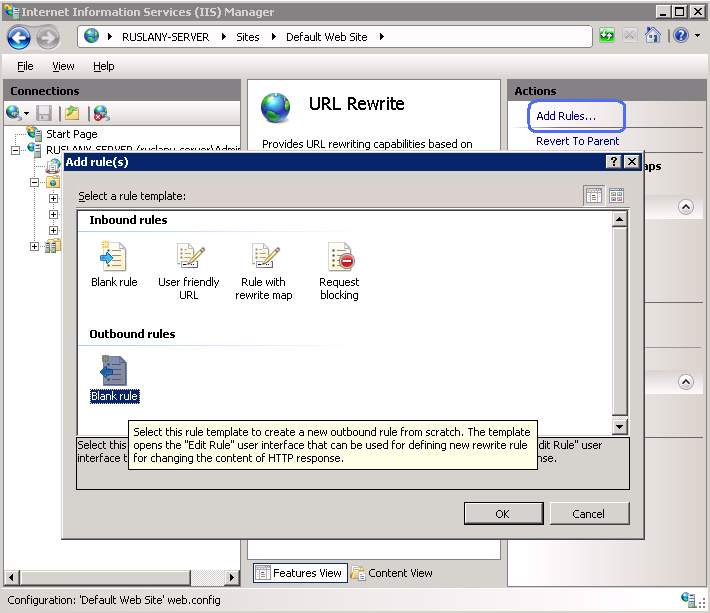 In this walkthrough you have learned how to use outbound rules in URL rewrite module version 2 to modify the content of the HTTP response on the fly. This capability is very useful when you need to perform minor modifications to HTTP responses generated by Web applications, but you do not have control of the application or it is not practical to make large-scale changes to the application.